We have a pine tree in our back yard that would be a perfect residence for gnomes. We've sent out the word. The housing market is difficult right now, and so far, there have been no inquiries about the property. However, I feel confident that we shall have gnomes take up residence in our pine tree before the summer is over. You can find doors like this one, and other ones too, at Nothin' But Wood on Etsy. I found a CafePress sticker that I should have on my case or somewhere else visible: "Being a good mandolin player is 3% talent, 97% not being distracted by the internet." My goal is to practice with focus and intention at least two hours a day. That time is often early morning or later in the evening, and not necessarily all in one time-slot. I'm a long way from where I want to be, but if you talk to other musicians, you'll find that they're in a similar boat. One experienced guitarist I had the privilege to hear live said that he had been working on a piece for about 3 years, and he "almost had it." Then, he played it, and it was lovely. I've been playing mandolin for almost a year. I started taking lessons after I'd been playing on my own for five months, and found out in the first lesson that my pick direction was wrong! When I told that to a woman who'd been playing for five years or so, she laughed and said, "I had been picking wrong for much longer than that before I found out I needed to fix it." The following melody sample is Scottish author/musician Norman Maclean's "A Scarce o' Tatties." I've been playing for almost 12 months now, and have hopes of progressing throughout the years. (My teachers laughed when they asked me what my goals were, and I unfurled a page-long 50 year plan.) You can find the sheet music and MIDI files for all the variations at The Session. If you hunger for more Scottish traditional music, be sure to visit Nigel Gatherer's page. With resources like these, it's hard not to get distracted by the internet! Seal’s been fishing for a thousand years, and he knows that I have too." A celloist and a fiddler contemplate musical genre-hopping. Marla Fibish and Jimmy Crowly playing a set of reels, of which the first, the Humors of Bandon, is my favorite. O'Carolan's Welcome, by Irish harpist Turlough O'Carolan, performed by the Waterboys. Canzone Danza, by Alexander Wandrowsky, played on ukulele and guitar. It sounds pretty on mandolin, too. These days, the majority of my sewing projects are custom orders on and off Etsy. I enjoy creating dolls I've dreamed up, and then offering them in the shop, but it's come to the point where I need to be able to justify financially the time spent sewing. I use reading glasses when I sew, and need bright, direct light so that I neither pierce myself nor give a doll purple hair instead of brown. Sometimes the purple hair is intentional, though. The groom is wearing a cabby hat and is playing a green Gretsch guitar. As a surprise for the bride, I stitched a little pocket on the inside of the groom's cape and tucked in a red felt heart. 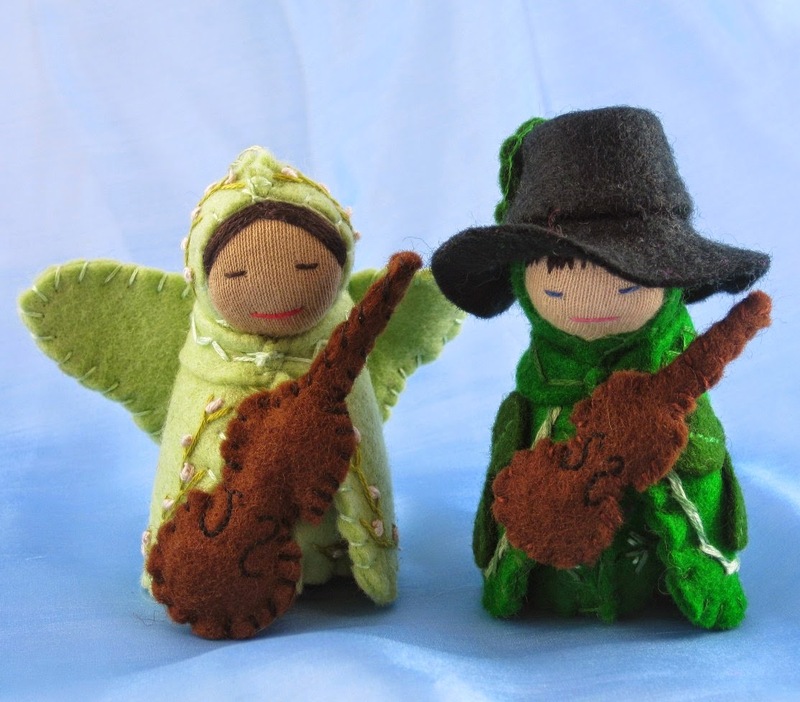 My next musical custom order is for a choir singer. Once I figure out how to convey the choir book in felt so that it looks like more than a black and white rectangle, I'll add that photo as a shop option. I'm planning on giving my shamrock fellow (stitched last March) a tenor banjo, too. Who doesn't need a tenor banjo?! The Waterboys' "Killing My Heart"
I am enjoying this 1998 video recording of the Waterboys' Killing My Heart, an alternate version of When Ye Go Away, especially Anto Thistletwaite's slide mandolin work. I have a mandolin, and I have a slide, but am not yet ready to combine the two! Thanks to the Waterboys Appreciation Society tumblr for the link. I turned 42 yesterday, which as Douglas Adams fans know, is the answer to the meaning of life, the universe, and everything. The day was mellow and rainy. I met a friend for lunch and then took Lucia out to dinner. With my blessing, Bede went to Emerald City ComicCon to sell his art. After all, there was a year in which I had two storytelling gigs on our wedding anniversary, as we decided that we had to go with the opportunities when they presented themselves. The night before, Bede took me to Dusty Strings to buy a solid-wood mandolin for my birthday. 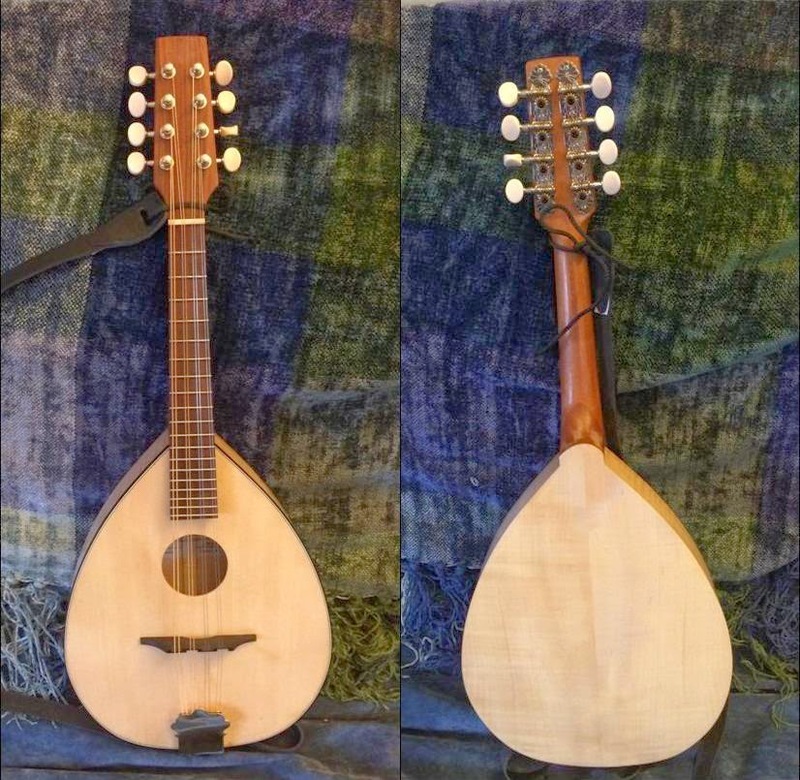 I had thought that a mandolin of my own was many months away, as it is much more challenging to find a decently-good mando than a decently-good guitar an affordable price. This "entry-level" Collings MT A style mandolin, for example, retails at $2700 USD. I had on my wishlist a factory-2nd Big Muddy mandolin that had a few surface blemishes on the back of the neck (which lowered the price significantly), but was structurally sound, beautiful to hear, and accessible to play. Edited to add: I got the Big Muddy mandolin on my wishlist. One of the highlights of that evening was when the man who helped me choose the new love of my life* demonstrated one of his new favorite mandolins. The other mandolins on the wall reverberated in response. I was reminded of what one of my teachers at guitar camp last summer said: the audience is important because every human is a resonator. He said that you might get a recording that's almost as good as a live performance if you have particularly good acoustics, but there is no comparison to the sound you get with a live audience. *I love all my instruments. Gentle suggestions to let some of them go are met with puzzled frowns until someone politely changes the subject. A couple of months ago, I brought home a friend's electric-acoustic mandolin on long-term loan, cleaned it up, and then brought it to the local music shop to have the bridge lowered and the strings restrung. Not long after, my friend Dymphna said, "I must admit, I feel like you've got a new boyfriend who seems nice, but I just don't get." "What's not to get?" I asked. "I know it's difficult, I know that some of my chords sound like cows in pain, but listen to this pretty D chord!" I played it. She shook her head. "As a violin player, I feel like it's missing a bow." I replied, "The mandolin thinks your violin's bow is superfluous." I started to play ukulele as "cross-training" for guitar. Guitar was my first, best love, but ukulele was cute, accessible, and portable. Songs I composed on the ukulele sounded merry, while songs I composed on guitar sounded like dirges. I've not mastered either instrument and I don't have any unusual musical talents (enthusiasm and desire are my strengths). However, when I started to learn mandolin from the excellent Bruce Emery via his Mandolin From Scratch book, I remembered that, in addition to guitar, mandolin was an instrument my teenage self wanted to learn, but thought was out of reach. 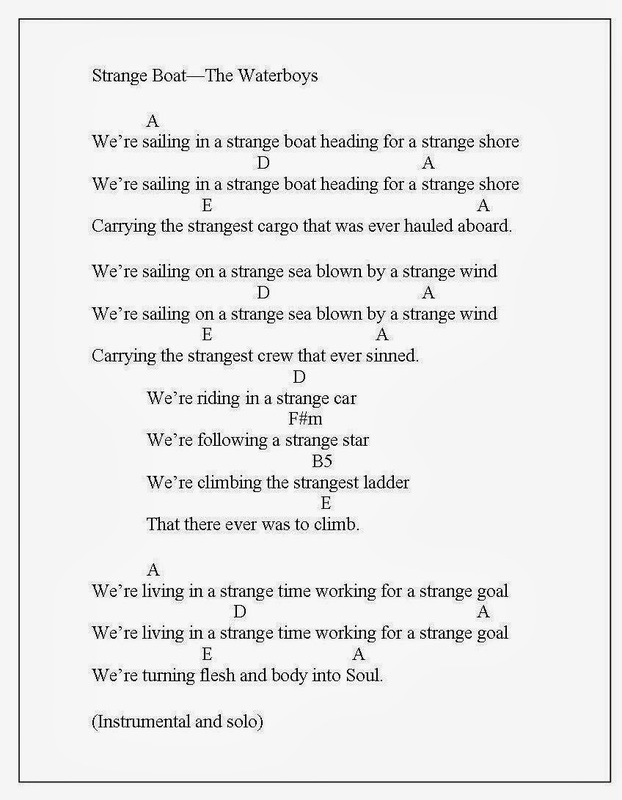 I am a long way from playing Led Zeppelin's The Battle of Evermore (my favorite song off of their fourth album), but I can play the New Britain version of "Amazing Grace" in G and D without too many gaps between the barred chords. Eventually, if I am diligent and practice regularly, I will get to melody lines. Someday, perhaps, I can work up to affording a relatively low-priced Big Muddy mandolin. In the meantime, I've got the "Octo-Lin," as I've nicknamed this Fender instrument. I bought a gig-bag and ironed on an octopus patch (Eight legs, eight strings!). Bede's banjo playing has progressed, and he is not used to being more skilled on an instrument than me, so now he gets to practice slowing waaaay down for me. We've been working on Jesse James and Gordon Bok's Dillan Bay, and are trying to make White Stripes' Hotel Yorba work, too. Others have already done it, as YouTube videos reveal. Down came the storm, but the octopus held fast. Then, the teeny tiny octopus jumped down and swam away. Sometimes, a cephalopod craves adventure. At a recent weekly jam night with friends, I brought the four chord I Love the Mountains song with all the verses as sung by Houaida Goulli. It's got the same chord progression as the ubiquitous piano duet favorite "Heart and Soul" by Hoagy Carmichael, and is good practice for chord changes. With guitars and banjo, we played it with the C/Am/Dm/G chord progression, but G/Em/Am/D works fine too. It's quite possible that these lyrics were inspiration for a song I'm working on with my friend Dymphna, called "All the Baby Creatures Need Love." We were kvelling over baby animals that don't traditionally show up on calendars. I mentioned baby squid. She nixed baby squid as looking like "jellied lucifers." That does it, I said, I'm writing a song with baby squid (called larvae, I found out) as well as many of the other baby animals that need care and attention. I acknowledge the faint possibility of anthropomorphization, but hey,there is a precedent. The lyrics are basically done, and Dymphna is working on the music. A few insects were deliberately excluded, such as lice and mosquitoes (clearly, I've got a ways to go), but Crocodylia, Cephalopoda, and armored/spiked mammals are well represented. I have been having a great time at weekly music jam and board gaming sessions hosted by a good friend of mine. We started out playing ukuleles together, but now, she has the itch to play guitar, and is loving her lessons. (Her eight year old daughter recently brought out her own pink uke and asked, somewhat wistfully, "When will we play ukuleles again?") Meanwhile, Bede revealed at the New Year's music camp we all attended that he'd always wanted to play banjo. After getting a couple of demonstrations from some clawhammer-style banjo players at camp, Bede rented a 5-string banjo, and has been plucking out "When the Saints Go Marching In" and "Jesse James." He sounds good, and I suspect that his four months of playing ukulele was key to awakening his inner musician. Eric Herman has his first new video in three years! The song is How Big, and has a lovely outro that makes me a little sniffly. Lucia and I helped with that outro, which was fun to do. We did not travel to Eric's recording studio, but made as clean a recording as we could with our video camera. A friend of mine was intrigued by a writing journal called Just Between Us: A No-Stress, No-Rules Journal for Girls and Their Moms, and posted a link on Facebook. Lucia and I were both interested in trying it out, and so I ordered a copy. Since we started writing in it, we have learned things about each other and seem to have developed new listening skills with each other. When we write out something out that has been on our mind, the clutter of the obligations of the day (homework, tidying up, etc.) momentarily ceases. We still have our parent-daughter pulls-and-tugs, but we're talking and listening to each other, and are enjoying each other's company. I hope we can continue this kind of communication through the teen years. We Shall See. I have a but few dolls in the shop as of late, but they are all new for 2014 (though the salamander doll was previously a Halloween-themed witch). I decided to start with smaller dolls like the heart cradle babies for Valentine's Day. Speaking of Valentine's Day, my weekly music jam friend and I are working on co-hosting a "Take Back Valentine's Day" party. Really, it's just going to be our weekly music and board game gathering, but we're planning to pin felt hearts on our sleeves and openly declare that we are celebrating platonic friendship. For those of you who have a copy of The Daily Ukulele, and wish the book had a list of the two and three chord songs, I have compiled such a list for you. Please let me know if you find any errors. Many thanks to all of you who shared your December holiday memories on this blog for the recent giveaway called A Simple Gift. I entered all of your names (including one who emailed me off-blog because Blogger Ate Her Comment) in a hat, and chose two people to receive the little cradle babies I made. I wish I could send a cradle baby to all of you. 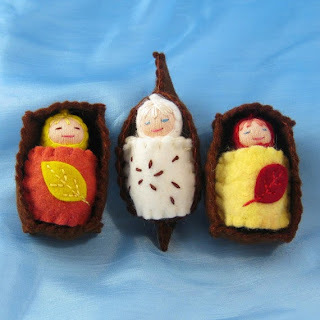 I do plan to make more cradle babies in the future, and perhaps feature them as Christmas tree ornaments for 2014. A wonderful give away and I would give it to my eldest daughter who is expecting her first baby. What a sweet memory it would hold for her for years and years. My sweetest memory of Christmas has been each and every Christmas of my 59 years. Each year there has been a memory to treasure. The joy and love of family is a treasure, especially as we gather together at Christmas. This is just lovely, as are all of your dolls! I would give it to my 5 year old daughter. She has one of your little purple angels that guards her closet door at night and helps her have sweet dreams. It's hard to single out one holiday memory, but what stands out most to me is coming home from midnight mass and goofing around with my siblings until we finally got sleepy enough to go to bed. Everyone was together, and feeling lighthearted. It isn't one particular toy or other gift that I remember, but being together and having a good time. As I remember those times, I am inspired to make a vow to turn off my computer on Christmas Eve and leave if off the whole next day so that my daughter gets my undivided attention. Patty and SadieBess, I hope your daughters enjoy their presents! I didn't think I would have time to do any giveaways this season. 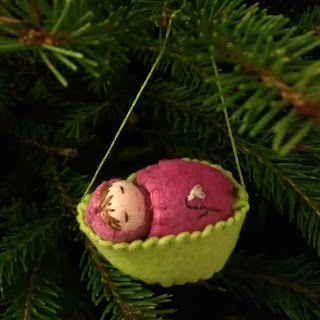 But then, I made a little baby in a cradle for my daughter in anticipation of St. Nicholas' Day (this Friday, December 6), and decided that I would somehow make the time. This season, the presents I give will, as much as possible, be hand-crafted or composed by me. Chances are, I will sew a lot of these gifts, but I may come up with little songs, bake savory treats, or find something else that may be humble in terms of monetary cost, but convey love and thought. The giveway runs from now until midnight (PST) of Friday, December 6. I will choose two recipients at random and contact you to find out your snail mail addresses. This will need to be quick in terms of turnaround time-- if I don't hear from you by Monday, December 9 (10am PST), I will choose another recipient. This giveway is open to residents of Earth (sorry, Mars colonists!). If you are a recipient who lives outside of the USA, please know that I have to disclose the full value of the doll, and that there may be customs charges which will be your responsibility. Updated: I realized I should have shared a December holiday, memory, too. I am going to cheat a little and refer you to a blog post from 2005. Thank you much for sharing your memories. I won't comment as I usually do, but I can tell you that it is truly lovely to read them. Just so you know, if you have a memory that is harrowing or sobering, that's okay to share too! I rediscovered the music of the Waterboys (i.e. Mike Scott and whomever Mike Scott wants to perform with) at a time when I needed their music. I had the Fisherman's Blues album, and in September, learned the chords and lyrics to some of the songs (the title track, And a Bang on the Ear, When Ye Go Away). When I wondered, "What has Mike Scott been up to lately?" I found that Scott had released a whole album of W.B. Yeats' poems set to music, called An Appointment With Mr. Yeats. I bought the album, but took awhile to get through it, as I would stop a track to learn the chords of a song that gripped me at a particular time. I've spent quite a bit of time on the bluesy Lake Isle of Innisfree. Last Friday, a friend of mine and I went to see the Waterboys in concert at the Neptune Theatre. (The Seattle Times review is here. I think I must have been standing quite near the photographer, as I was standing in the third row near fiddler Steve Wickham, a.k.a. "The Fellow Who Fiddles.") The band opened with Strange Boat off of the Fisherman's Blues album. It's a relatively simple song in terms of chord progression, with lyrics that touch upon the spiritual without being religious. When I decided that I wanted to learn the song, potentially to share at a music jam, I was surprised to find on the internet how painfully wrong the chords on different websites seemed to be. I write the following knowing that there is a chance someone better-versed in music theory will arrive to say, "Actually, you're dead wrong on this." And you know what? That's fine. I'd rather have corrected chords than keep erroneous information. I listened to live performances, as well as watched carefully Mike Scott's hand positions on the fretboard, but still... let me know if you find something different from what I'm posting. I'm sharing these chords for whomever comes looking for them. Welcome, kind strangers! The song is originally played in the key of A, and the first two verses have a simple I,IV,V chord progression (in this case, A, D, E). 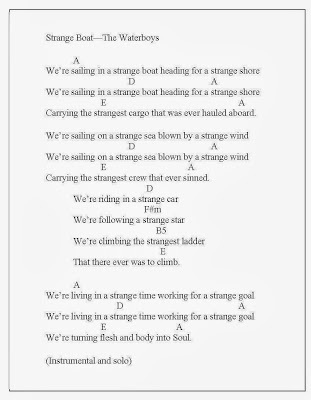 The bridge ("We're riding in a strange car/We're following a strange star...") brings in a partially-barred F# minor in lieu of an A. Scott then plays a B6, which is in the same fret neighborhood as the F# minor. I've got a virtual guitar chord-book linked on the right side of my blog, but you can go directly to that site right here. Click on the jpeg graphic to enlarge it. This is the between-time of seasons. The summer farmer's markets end and the autumn rains begin. My daughter is in public school now, as our homeschool adventure was a short but enriching experience that was never meant to be more than a necessary stop-gap. I've had to let go of some friends who were dear to me, but I've also made new friends with whom I will travel as far as we are willing to go. There is heartbreak and beauty, painful growth and glorious song. I am attempting to bring some focus to the new wealth of music I've been exposed to this last month. I continue to work on improving my guitar skills as well as finding lovely melodies on the ukulele. I find that, when I play the uke, it is impossible for me to settle into a melancholy mood. The documentary The Mighty Uke is a delightful introduction to the history and resurgence of this instrument. While I wish I had indeed brought my ukulele to guitar camp, I am glad that my uncle got to be my first teacher. Today, I am playing on the ukulele Fisherman's Blues by the Waterboys. Here are the chords to the song: G, F, A minor, C. Repeat!